Dr. Marvin Sambur has been appointed Professor of the Practice with the Institute for Systems Research. He is the third person so named within the A. James Clark School of Engineering. Sambur's impressive track record of achievements and contributions span both research and leadership in industry and government. As Professor of the Practice, he will assist ISR faculty with research program development, aid faculty and staff with industry and government agency collaborations, and participate in educational program development. Sambur currently serves on important government advisory boards, including the Air Force Science Advisory Board and the National Academy of Science Board for the Department of Defense. 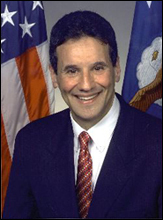 From 2001-2005, he served the nation as Assistant Secretary of the Air Force for Acquisition. In this position, Sambur formulated and executed a $220 billion Air Force investment strategy to acquire systems and support services to provide combat capability to joint warfighting commanders. Among his many important contributions in this role was transforming the Air Force’s acquisition process by bringing systems engineering into all stages of the acquisition process. From 1977-2001, Sambur held senior positions at ITT Corp., serving as President and CEO of ITT Defense from 1998-2001. During 1968-1977, Sambur also worked with Bell Laboratories. Sambur completed his undergraduate studies in Electrical Engineering at the City College of New York in 1969, and earned his MS and PhD in Electrical Engineering at MIT in 1969 and 1972, respectively. During his years in industry, he made many contributions in speech recognition, speaker identification and satellite communication systems. As President and CEO of ITT Defense, Sambur opened new opportunities for the company that resulted in major growth in its business, and was highly regarded in the domestic and international defense industry as one of the leading minds in defense electronics. ISR welcomes Marvin Sambur as Professor of the Practice and looks forward to working with him in the coming months and years.